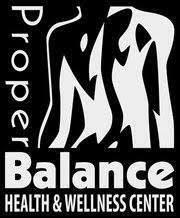 Our mission at Proper Balance Health & Wellness Center is to better the immediate and life-long health and well-being of our patients via the integration of chiropractic, massage therapy, physiotherapy and nutritional care. We are committed to relieving the everyday pains and stresses of their lives. We strive to accomplish these goals while maintaining the highest ethics, integrity and professional standards possible. The all natural approach we take to health and wellness helps our patients reduce or eliminate their needs for unnecessary medications and invasive surgeries by allowing their body to repair itself utilizing its own intrinsic healing powers. They are continually amazed by the rapid results they are able to achieve.